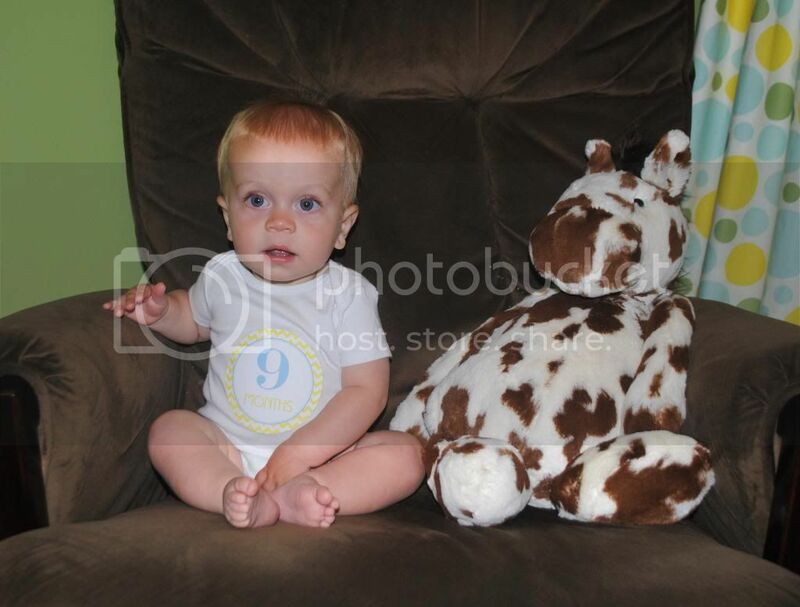 Moments with the Mays: Griffin is 9 months old! 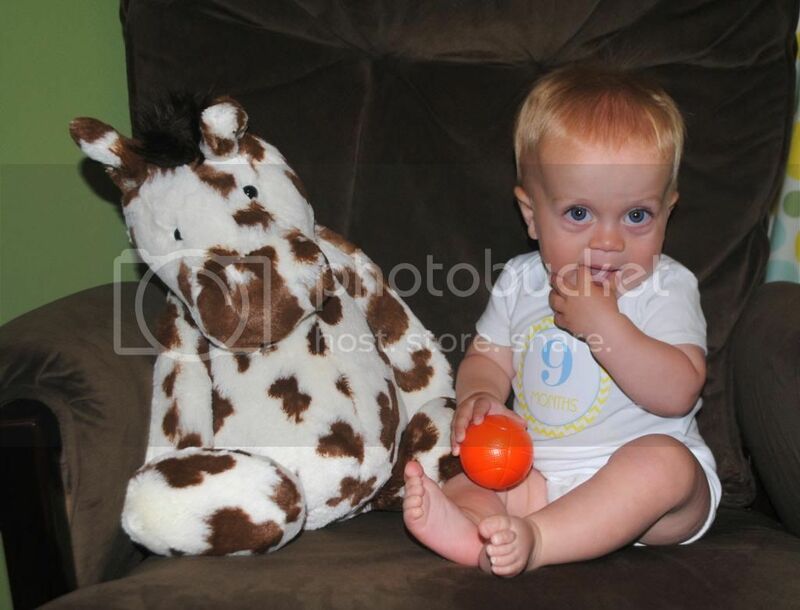 Griffin, you are now NINE months old!! 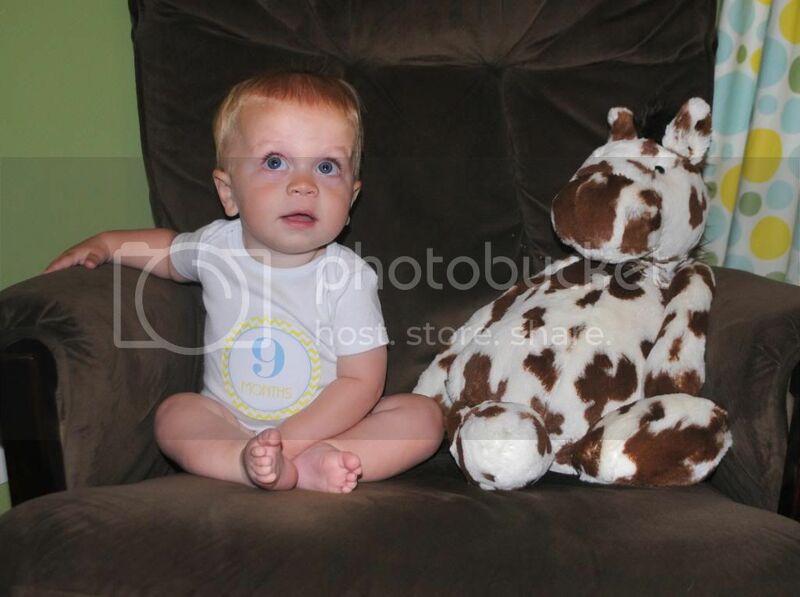 Clothes: 9 month & some 12 month clothes -- you finally had a little growth spurt! You are wearing mostly 12 month pajamas for the length. Diaper: graduating to size 4 this week! Eating: You are still LOVING meal times! You are still drinking four 7-8 ounce bottles a day. You could probably go longer because you never seem hungry for a bottle. You are eating only table food now & I love it! Watching you try new foods is so fun. You get so excited about eating & shovel food in your mouth so fast. It's hilarious! Your absolute favorite food is blueberries. I'm pretty you could eat a whole Publix container of them in one day. You are eating meats now on a regular basis & love chicken! I've been documenting your eating adventures (mostly because I want to remember!) on Instagram under #griffsgrub. You make some funny faces while chowing down! You are eating 3 meals a day and usually 2 snacks. You are also learning how to drink water from a sippy cup & have already mastered the straw. Smart boy! Sleeping: YOU ARE FINALLY SLEEPING THROUGH THE NIGHT CONSISTENTLY. (knock on wood.) Phew. It only took about 8 1/2 months! ha! You are taking 2 naps a day & sometimes you try to fight them like crazy! I spend a lot of time rocking you before naps. You go to sleep around 7:30 & typically wake up around 6:30. We surround you with pacis & you can now find them when you need them. That was life changing. Not even kidding! You recently started standing in your crib...so, that's interesting! first boo boo. You were crawling outside and slipped on the sidewalk. Your little face hit the pavement and it was the first time I saw blood on you. It was pitiful! CRAWLING! You are a full time speed crawler now & probably crawl about 2 miles total daily. You are busy. we took our first solo road trip to Georgia! Let it be known that you despise the car. Sadly, you got into your first car accident on your actual 9 month birthday. Thank the Lord that it wasn't serious & we were both fine! It did scare you though! You are really starting to talk more. You are saying "Da da da" & "Ba ba ba" a lot. I have no idea what you're saying, but you talk a lot more now! Clapping! You don't do it on command yet, but you will randomly clap your hands and it's the cutest mathing I've ever seen! 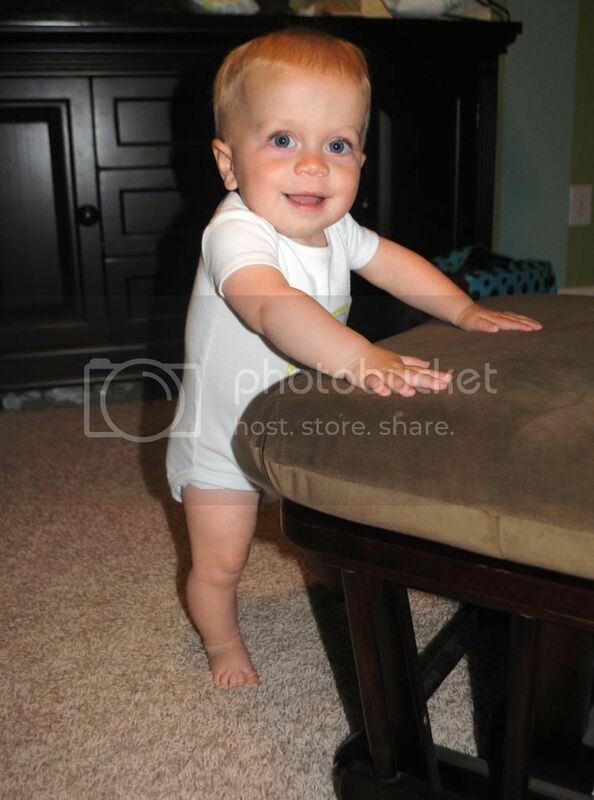 crawling like a mad man all over the house & yard. walking while holding on to someone's hands. Dogs! You spot them a mile away and just light up! holding hands while you fall asleep. being outside - just like your big brother! when Mama leaves the room. being contained -- we packed up all the toys that held you in! Griffin, I give you a hard time a lot about how high maintenance you can be, but you really do have the best disposition. People tell me that all the time & they always ask if you're always this happy. You smile & giggle all day long. The only time you get cranky is when you're sleepy. We came back from Georgia and you had an ear infection. Even when you were sick & feeling bad, you were still acting happy! This month has been so much fun watching you learn so many new things. 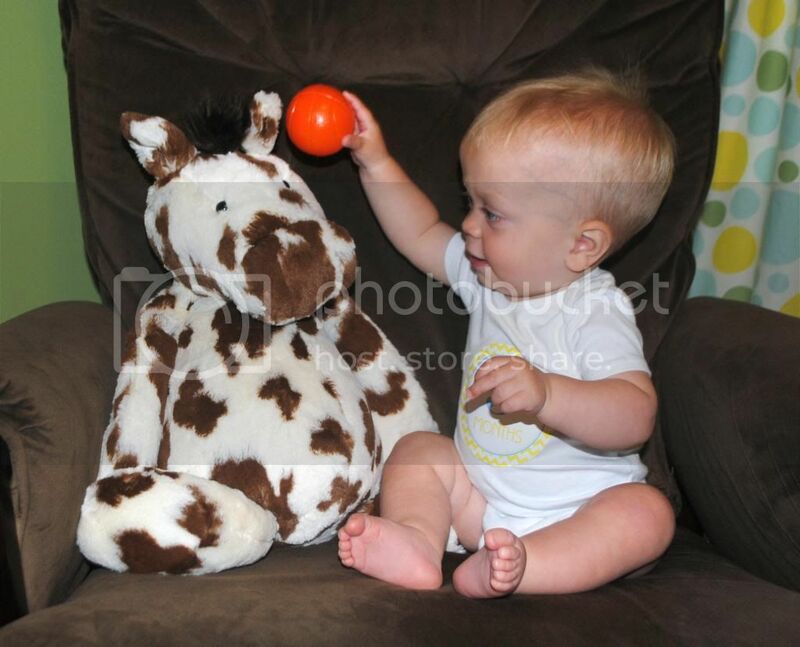 You watch everything your big brother does & want to chase after him already! I don't blame you; he's pretty fun. You are such an explorer already & I really have to watch you. You tried crawling up the stairs this morning! You are a busy, busy boy who is always on the move. Maybe that is why you are sleeping so well now! 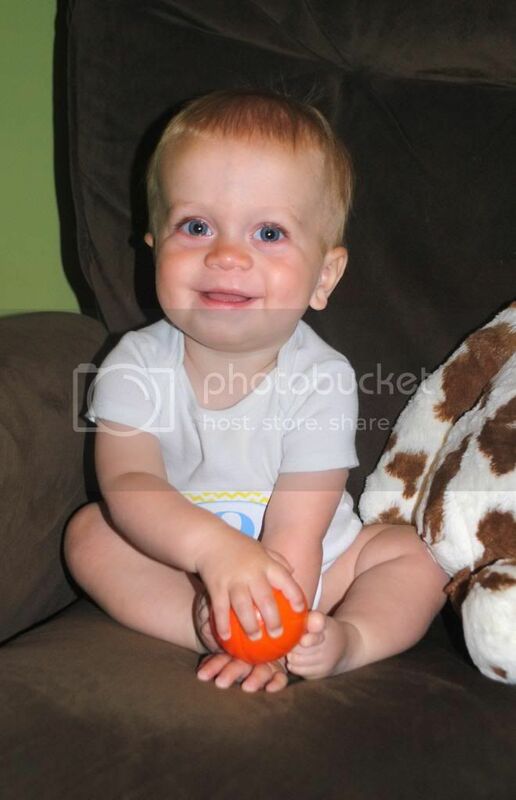 It's hard for me to believe that 9 months have already passed & that we are already starting to plan your 1st birthday. I want to bottle up this age because I just love it so much. 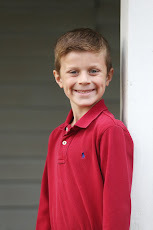 Griffin, we can't imagine our lives without you. That sweet gummy smile (still only 2 teeth!) makes every day brighter. I love how you love Grayson & seeing you 2 interact makes my heart feel like it may explode. It is so sweet! 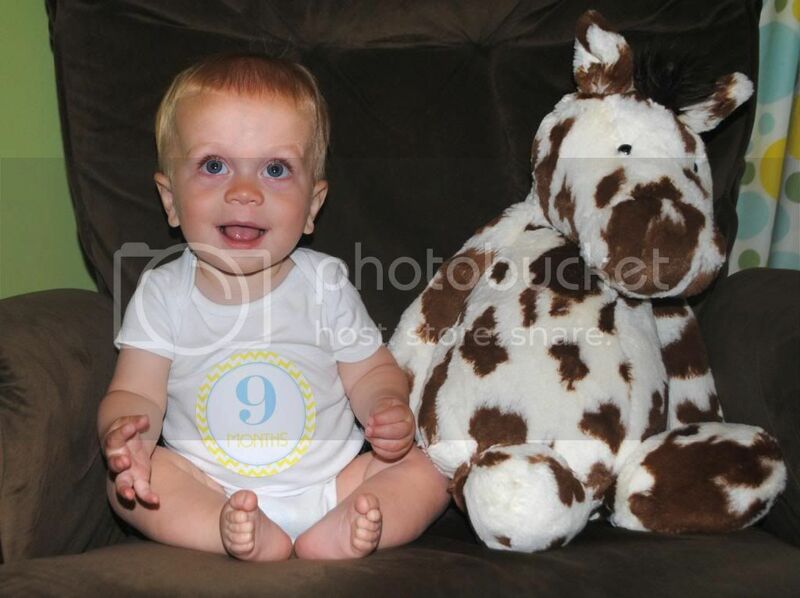 Happy 9 months, Griffin! We love you! Twins. TWINS I TELL YOU. Ollie only has 2 teeth and has the happiest disposition too. Though we have regressed in the table food category. He has gotten lazy and doesn't want to pick it up unless it is a favorite thing. He will eat it off the spoon no problem no matter what it is. TURD. We made it 9 months mama...margaritas for us! He looks so much like you! I love all his eating pictures that you post on IG. 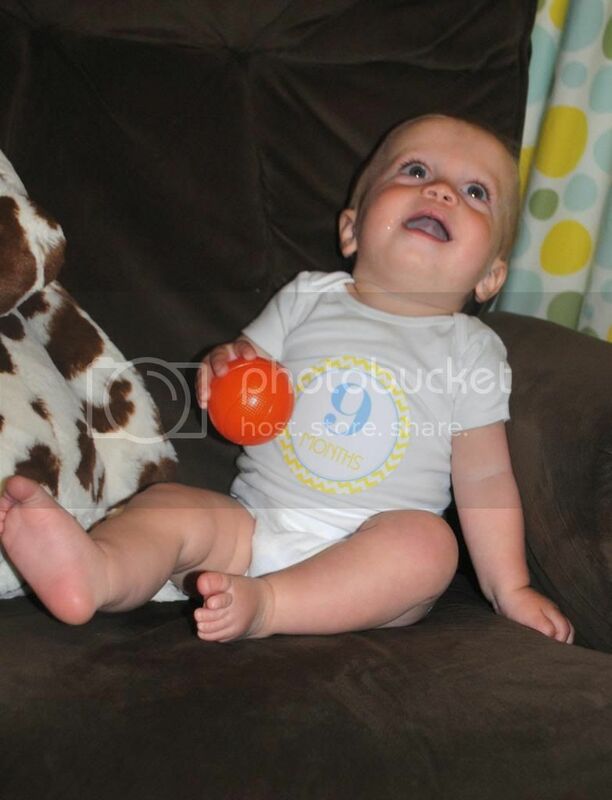 And I can't believe that he is already 9 months. I know I always say this but the time is flying by.